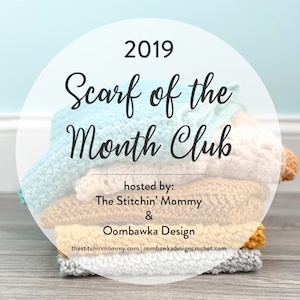 ~ Add this pattern to your Ravelry Favorites and Queues! If you would like a firmer sun hat or only a firmer brim, you can use a fabric stiffener, for example Impex HT1600 | Hi Tack Fabric/Textile Stiffener. SIZE: Adult Women. One size will fit most women. Front Crossed Double Crochet (fcrdc): sk 1 st, work 1 dc into the next st, 1 dc back into skipped st going in front of the last dc just made. Watch this Video Tutorial on YouTube to learn how to make a fcrdc! Back Crossed Double Crochet (bcrdc): sk 1 st, work 1 dc into the next st, 1 dc back into skipped st going behind the last dc just made. 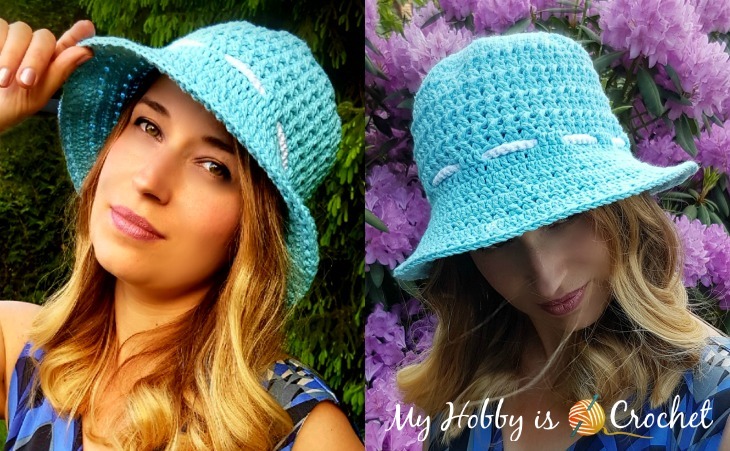 Watch this Video Tutorial from Crochet Cabana on YouTube, to learn how to Back Crossed Double Crochet! The ch 1 at beg of rounds does not count as a stitch. Work the first st of the round into the same st as the beg ch1. The joining at the end of the round will be made into the top of the first hdc, not in the beginning ch1. Round 10 (Back Crossed Round): ch2 (will not count as a st here and the next rounds), work 45 bcrdc sts around, sl st to top of first dc. Notes: To hide the ch 2 at beg of rounds start the first bcrdc this way: skip the first 2 sts, work 1 dc into the next st, 1 dc back into 2nd skipped st going behind of the last dc just made. Before you make the last bcrdc you’ll have 1 st left in the round. Work the last bcrdc of the round: skip the last st, work 1 dc into the very first st of the round (the st below the beginning ch2), 1 dc back into the sk st going behind the last dc made. Round 11 (Front Crossed Round): ch2, work 45 fcrdc sts around , sl st to top of first dc. Note: Use the same technique as for the Back Crossed Round to hide the ch2. Rounds 12- 17: Repeat as rounds 10 - 11. Round 18: work 1 csdc, 1 dc into each of next 2 sts, ch2, sk next 2 sts, *1 dc in each of next 3 sts, ch2, sk next 2 sts, repeat from * around, sl st to top of beg csdc. Round 21: ch 2 (will not count as a st), work 54 frcrdc sts around; sl st to top of first dc. Round 23: ch 2 (will not count as a st), work 63 frcrdc sts around; sl st to top of first dc. Round 25: ch 2 (will not count as a st), work 72 frcrdc sts around; sl st to top of first dc. 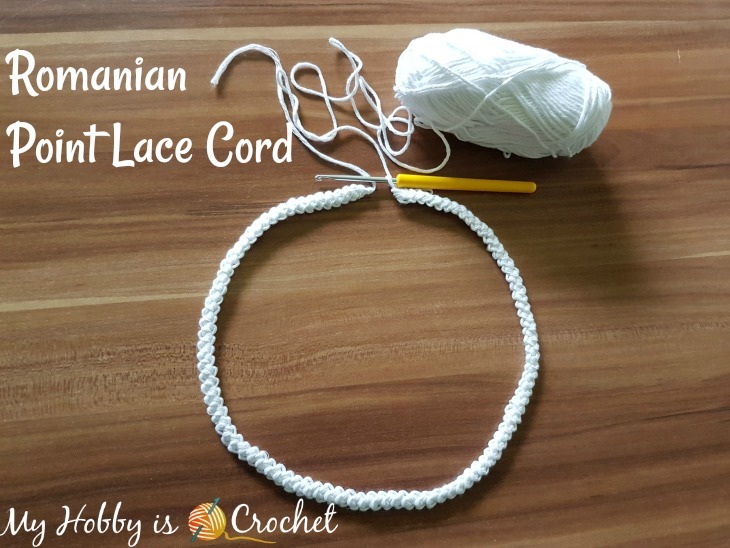 The cord is worked using the Romanian Point Lace Cord. Watch the Video Tutorial by Planet June below to learn how to crochet the Romanian Point Lace Cord! With a 3.5 mm crochet hook and a contrasting color work a cord measuring 58-60 cm. 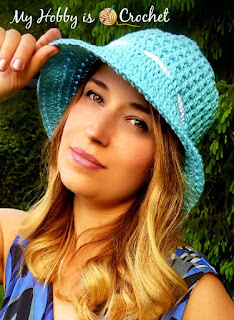 Leave a long end of yarn to sew the cord ends together after inserting it through the sun hat. Weave the cord through the ch 2 spaces of round 18. Place the hat on your head and adjust the length of the cord to make the hat fit; then sew the ends of the cord together being careful not to twist the cord. 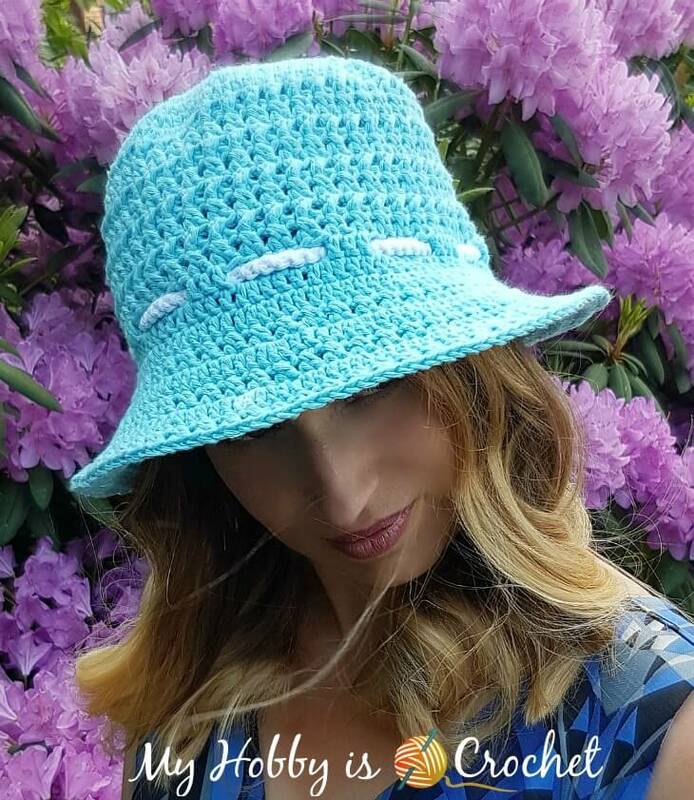 I hope you enjoy this sun hat pattern! Thank you for the wonderful easy hat patterb and the lesson on making the cord. Love the cord--simple and easy with very good and complete instructions. But I'm over 70 and would like written directions. I can copy instructions if I can find them. Why do I feel like this is going to be way too big? Does it take a while to start to curve like a hat. I'm on my 4th row of X stitches and the top is still flat. Am I doing something wrong? It should curve Jenny. What yarn and hook size are you using?